I've officially decided that I'll be wearing this poncho non stop for the next few weeks. It's by far the coziest item that I own, besides my pajamas of course. Best part? It's reversible from plaid to graphic black and white pattern - Hello versatility! I was so excited for you all to get this poncho, unfortunately it's sold out everywhere. I did however link a few similar ones below for you to check out. I will definitely let you know once it's back in stock! This gorgeous headband kept my ears super warm this week as the temperatures dropped dramatically. You may recognize my new black leather ankle boots from my favourite boots for fall post. I decided to go with these gorgeous classic black ankle boots with zippers. I also purchased another pair, which I will be featuring in my upcoming post. To finish off the look I paired this gorgeous poncho with a pair of black skinny jeans, black leather ankle boots, 1/4 sleeve back top, a grey headband, and a grey tote. Thank you Gemma:-) It definitely caught my eye also! 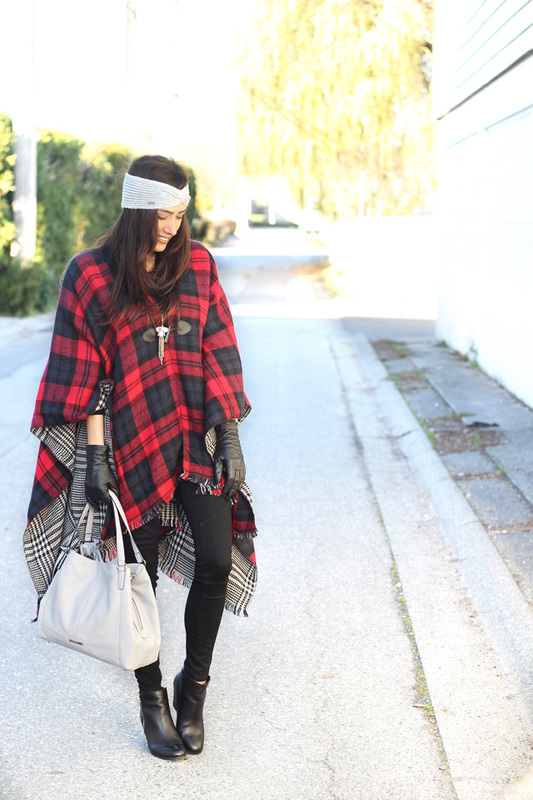 I love this poncho and you have styled it perfectly! The gloves and headband finish off the entire look for a polished feel! Gorgeous! Thank you so much Molly! I've been wearing this headband a lot with the weather getting so cold and having to stay bundled :-). Wow you look stunning in these photos. I love this outfit too!! That poncho is amazing!!!! Love the patterns on both side. Also love those ankle boots, I have been looking for something exactly like that! The reversible print is so cool! I love it! And the headband you added is a great touch. Love the necklace too! Oh man this poncho is amazing! I love that it's reversible - it lends itself to being worn day in and out in different ways. Thank you! Definitely the best part of the poncho for sure:-). You look gorgeously chic Ela! Loving this poncho and that its reversible! Such a win! Loving the leather gloves abd your cute headband too. Hope ur having a great Monday so far! OMG this outfit is everything! You look gorgeous and this is styled to perfection:) Happy Sunday! I have a similar blanket scarf that I totally need to style like this. You look so great! Loving your new boots! Thanks Amy! So glad I got these ankle boots, they are not only super cute but definitely really comfortable and of course versatile :-). Have an awesome week! This is probably the prettiest poncho I've laid eyes on and they're reversible! Yes! This cape is everything! You look amazing in this red poncho and I love this bag. Perfection! This is one of the best ponchos I've ever seen, I like your look.